When recent floods hit Louisiana, many people lost homes and businesses. Among them was a homeless man, who lost his only shelter — a cardboard box under a highway overpass. Responding to the disaster in his capacity as a physician and commander in the U.S. Public Health Service, David Sugerman ’99 got to know the man and, while treating his medical needs, heard his story of military service, drug abuse and a life that spiraled out of control. “It was a wonderful opportunity to provide him medical care and to help him get needed services, an apartment and job training,” Sugerman said. That intersection of medicine and social services attracted Sugerman to a nontraditional form of medicine — one that has taken him throughout the world responding to medical crises. After graduating from Washington and Lee in 1999, Sugerman earned a medical degree from Thomas Jefferson University and completed his residency in emergency medicine at Johns Hopkins University Hospital. Today, he is a medical officer at the Centers for Disease Control and Prevention, assigned there through the U.S. Public Health Service (USPHS), with the rank of commander. The uniformed service, modeled after the military, is overseen by the surgeon general and is the largest division of the Department of Health and Human Services. Commissioned officers serve in more than 20 duty stations throughout the federal government. Sugerman entered USPHS as an officer with the Epidemic Intelligence Service (EIS) in San Diego. For two years, he helped respond to such crises as a measles outbreak among intentionally under-vaccinated children, the first case of pandemic H1N1 flu and meningitis across the U.S. – Mexico border. For two months, he was stationed with the U.S. Army in the Democratic Republic of Congo responding to an outbreak of monkeypox. He then joined the Global Immunization Division, where he worked on polio eradication in Nigeria, improving oral polio vaccine coverages. He responded to the earthquake in Haiti, the Ebola outbreak in Sierra Leone, the Deep Water Horizon oil spill and Hurricane Sandy. In Sierra Leone, the opportunity to train local staff, set up screenings and isolate patients in the hospital or their homes, was rewarding and worth the effort, when, after three years, the country was officially declared Ebola free in March 2015. Sugerman has been based in Atlanta since 2009. At the CDC’s National Center for Injury Prevention and Control, he helped establish guidelines for training, triage and transport for trauma patients, and worked on new guidelines for prescribing narcotic pain medications in order to prevent drug overdose. Now with the Center for Global Health, he oversees training of epidemiologists in developing countries. Originally begun in 1975, the program has trained more than 8,000 epidemiologists in investigation, surveillance and intervention for disease control. “We station senior epidemiologists to live in the countries and provide direct technical assistance to the government,” he said, noting that the program handles about 62 programs in 46 countries. Once a week, Sugerman works at the Emory University Hospital Emergency Department, where he teaches medical students and residents emergency medicine. Sugerman’s father was a trauma surgeon at the Medical College of Virginia, in Richmond, and from an early age Sugerman was interested in science. He began thinking about a career in medicine in high school, but knew he wanted to follow a less traditional path. Working with an organization called Metro Town Institute, in Richmond, to help improve diversity in the public schools, Sugerman met a W&L graduate who told him about the university’s small size, honor system and pastoral setting that would allow him to indulge his interests in hiking, biking and camping. At W&L, he also continued his service with Habitat for Humanity, which he had begun in high school. He became president of the W&L chapter his junior year and values the mentorship of advisor Professor Brian Richardson. Sugerman also values the support he received from then-President John Elrod and his wife, Mimi, who often invited him to their home for dinner. Mrs. Elrod served on the board of Project Horizon, a nonprofit organization for which Sugerman volunteered. He also served as president of PRIDE, a program to increase diversity in education and recruitment and encourage a welcoming atmosphere for all ethnicities. Sugerman and his wife, Ciara, who holds a Ph.D. in microbiology, are parents to three children under the age of 3: an adopted son, 26 months; a daughter, 18 months; and a son, 5 months. 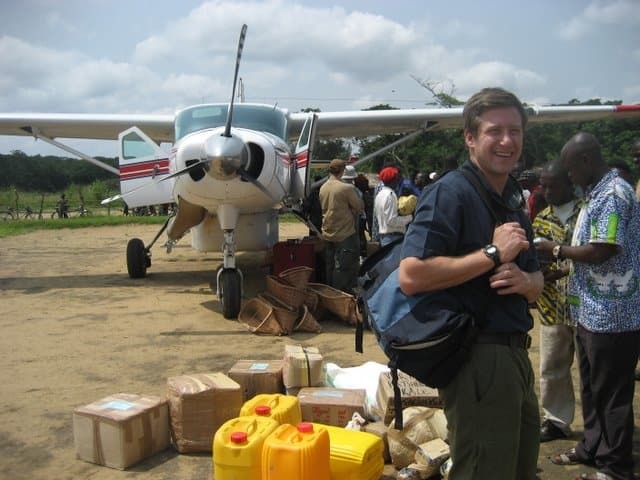 His wife also works for CDC, helping oversee global diarrheal disease response, including cholera and typhoid. Reflecting on his career, Sugerman said he gets tremendous satisfaction in training others to increase the knowledge of disease control and prevention. He enjoys working closely with his counterparts around the globe and said the trainees are very thankful for programs that make them part of the solution.